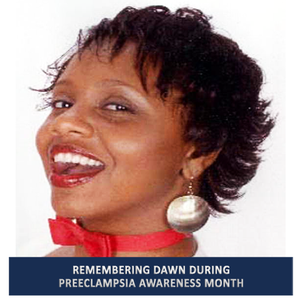 When I think about preeclampsia, a woman name Dawn Fleming comes to mind. Dawn was 31 years old, a member of my sorority, Delta Sigma Theta and a popular radio personality in Orlando. Although I did not know her personally, she was from my former home of Queens. She was gregarious, a community activist who died unexpectedly from a preeclampsia related stroke. She had recently married and delivered a baby girl 6 days before her untimely death. Her daughter is now approximately 16 years old and has never known her mother. When I attended Dawn’s wake, I was both angry and sad. I suspected someone had inevitably missed the diagnosis and by the time she was given treatment, it was too late. Such is the case of the vast majority of preeclampsia victims. By the time a diagnosis is made, the damage is already done. In her book, You Have No Idea, celebrity Vanessa Williams and her mother, Helen, discuss preeclampsia as the reason for her paternal grandmother’s death. I urge all of us to take a few moments to remember all the moms and babies who are no longer with us and stay tuned for more information about a tool that I’ve developed that will reduce the number of tragedies such as Dawn’s.